Summer fun—Who needs it? 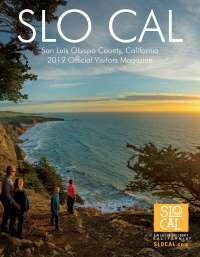 Autumn in San Luis Obispo County is a veritable wonderland of colorful experiences, and we don’t just mean the changing oak leaves (think blue ocean, golden sands, pink sunset and a bottle of red, red wine). This fall, ditch the parka and set your sights for sun, fun, and a cornucopia of fall excursions you can pull off effortlessly —sans mittens. Seriously. All you need to pack is a pair of flip flops and a corkscrew! Butterflies on the beach? No, you’re not hallucinating. This fall, marvel at thousands of black-and-orange Monarch butterflies as they make their fall migration to temperate Pismo Beach, one of California’s last quintessential beach towns. This year’s epic butterfly season begins on October 22, and kicks off with the Monarch Grove Grand Opening Celebration (November 5) featuring family friendly activities, interesting booths, and close encounters with the winged wonders (approximately 10,000 to be exact). Plus, you can’t not smile while receiving a butterfly kiss during a coastal sunset, right? Tip: Enchanted by the region’s miles of sandy beaches? Call Beach Butlerz and you’ll be well on your way to a crackling, no-fuss bonfire right on the sand. Talk about farm to face! Looking for a true outdoor adventure that might even get a little dirt on those brand new cowboy boots? Grab the kids, roll up your sleeves and pick your fill of apples at Avila Valley Barn, ground zero for delicious from scratch pies, produce, and hot apple cider, or any of the other u-pick farms in the Avila Beach or San Luis Obispo area. Take it from us: after a day of picking, you will have earned a quiet picnic at nearby See Canyon Fruit Ranch, a perfect oasis for cozying up with friends and family. The doctor didn’t say anything about drinking your apple a day, right? Bristols Cider House in Atascadero is a craft hard cider-lovers dream—a place where dry hopped, barrel aged, and out-of-the-box hard ciders mingle with gourmet eats and live music in a family and dog-friendly environment. That is not to say that Fido should partake in these fantastic fermented apple beverages. Treats for all! Make your 10-year-old self (and your kids) proud and give Halloween the amount of excitement it truly deserves...which, if you ask us, should be slightly more than the joy you feel after discovering your favorite show is streaming now. The kiddies will gasp and the grown ups will giggle at Zoo Boo at Charles Paddock Zoo in Atascadero (Oct. 29). The costumed shindig mixes wild animals—including a Malayan Tiger, Two Toed Sloth, and Gila Monster—with carnival games, a haunted house, and activities suited for every age. Keep an eye peeled for the annual Cambria Scarecrow Festival (Oct. 1-31), which dots the coastal Highway 1 hamlet with inventively constructed scarecrows dressed to the nines. Hint: you’ll spot the fun photo ops in store windows, wine tasting rooms, and art galleries galore, so stroll with your smartphone handy. A host of activities, including pumpkin decorating, costume contests, games, crafts, and a bounce house will converge in Pismo Beach for Pumpkins on the Pier (Oct. 29), proving that surfers can be spooky, too. Of course, no trip to SLO County is complete without a stroll through San Luis Obispo’s famous Thursday night Farmer’s Market, made a little more creepy by the annual Great Pumpkin and Scarecrow Contest (Oct. 20) and Pumpkins on Parade (Oct. 27). Want to scare ‘em half to death? The Mid State Scare (Oct 1-31) haunted house offers up a chilling fright for the bravest souls while the Cal Poly Corn Maze caters to the wimps among us (Oct. 1-31). The laid back beach community of Grover Beach will transform into a frightening fun fest during its annual Carved Pumpkin Contest and Halloween Activities (Oct. 28). For classic trick-or-treating fun, set your sights for Paso Robles’ quaint, zombie-infested downtown square for A Safe and Fun Halloween (Oct. 31). Clink, clink! Cabernet Sauvignon is King in Paso Robles, where warm days and cool nights ripen the coveted fruit to bold perfection. Raise a glass to this distinctive red wine—and a host of other Bordeaux red varietals from 22 local winemakers—at the Paso Robles CAB Collective’s CABs of Distinction Grand Tasting (Oct 14) at the stylish Allegretto Vineyard Resort in Paso Robles. Experience the excitement that touches every aspect of harvest in Paso Robles Wine Country, including picking, crush, and bottling processes at work during Harvest Wine Weekend (Oct. 14-16). Toast to the new vintage with wine-centric events overflowing at more than 200 wineries nestled within oak-studded terrain. Oh, and the sipping swirling doesn’t stop there, folks. They don’t call it Wine Country for nothing! Live music, educational classes, winemaker dinners, tours, a grand tasting, auction, and even more behind-the-scenes harvest activities will uncork during SLO Wine Country’s anticipated Harvest on the Coast (Nov. 4-6), which encompasses wineries from Edna Valley and Arroyo Grande to the sands of Pismo Beach. Craft beer nuts will rejoice during SLO Beer Week (Oct. 16-22), which features dozens of local and Golden State beers poured at tastings, dinners, and tap takeovers hosted by area restaurants and breweries. Oh, and Halloween fun gets a grown up twist with a screening of Arachnophobia Halter Ranch Vineyard in Paso Robles (Oct. 14), which just so happens to play a starring roll in the film. Eek! What’s the old saying? Bovines have more fun? Thanks to the public art exhibit Cow Parade (October – May 2017) 101 life-sized, hand-painted cows have taken over SLO County with whimsy, attitude, and sass to spare. Follow an interactive Cow Trail Map and traverse historic landmarks like the Madonna Inn or stop by local restaurants, galleries, and street corners in search of “mini moos” and bovine excitement. Get intimate with local artists and enter private homes, studios, and workspaces across the region during Open Studios Art Tour (Oct. 15-16). Create your own self-guided route and plan an afternoon filled with sculpture, paintings, glasswork, jewelry, and new artistic friends. Did I mention you can also get your fill of local fine art, photography, and crafty goodness while strolling the beach? Mark your calendar for Pismo Beach’s A Brush with Butterflies (Nov. 5). More of a treasure-seeker? Not all that glitters is gold at Paso Robles’ Golden Oak and Honey Festival (Oct 22), where antiques, collectibles, and beekeeping seminars collide in a buzz of commotion. Ready to plan your trip? BOOK TODAY!